Children in the colonial era were taught that the Indians’ Great Spirit was an avatar of Satan. Children today are taught that the Great Spirit is a version of the Christian God. How far from the truth are both these ideas? How—really—and how much did Algonquian perspectives on death and life and the sacred and profane diverge from European perspectives? The creator power was regarded as the equal of other powers in the skyworld and the underworld, but it is Kitanitowit’s Gitchi Manitou that ascended to prominence under the influence of Christianity. Of all the great spirits, it most resembled the Christian God and was transformed accordingly during the Contact Period. Today, Word autocorrects manitou for Manitou. 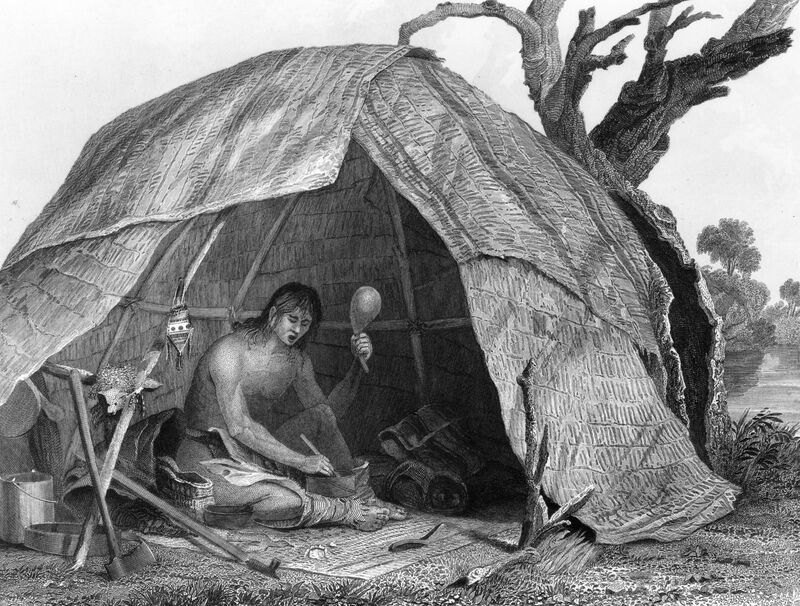 An Algonquian shaman making his “medicine.” He chants as he mixes various ingredients together, while shaking a calumet (rattle). 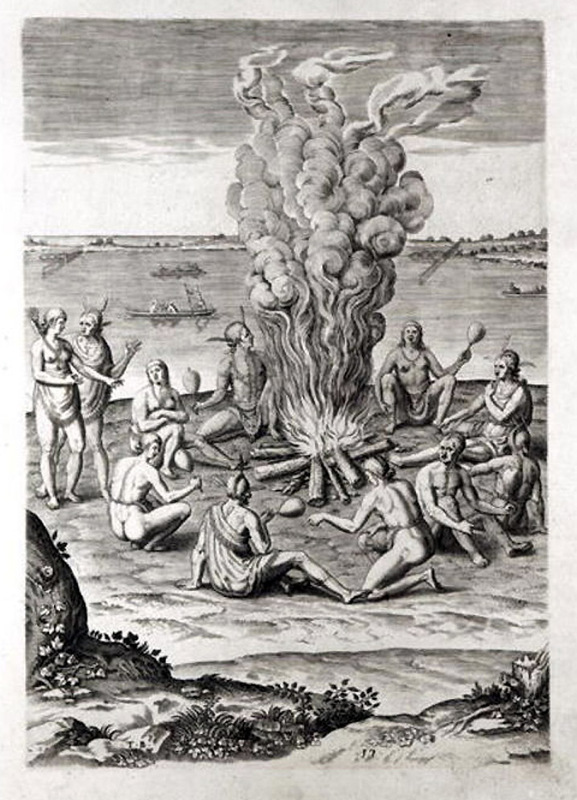 Indians praying around a fire, engraving from Hariot’s “A Briefe and True Report of…Virginia, 1590” by John White. I think this divergence in beliefs is the real source of the incredible mismatch between the Indians and the Europeans, equally driven by their beliefs (and, in my opinion, equally irrational). Their ultimate mutual failure in cultural contact was the result. From the beginning the Europeans dehumanized the pagans, and the earliest Indian wars against them were attacks on Christianity. Today, Manitou is perceived as a physical entity in the image of man rather than as a supernatural force: a Judeo-Christian patriarch—Moses and Jesus and Katanitowit all rolled into one. What should we tell the children? 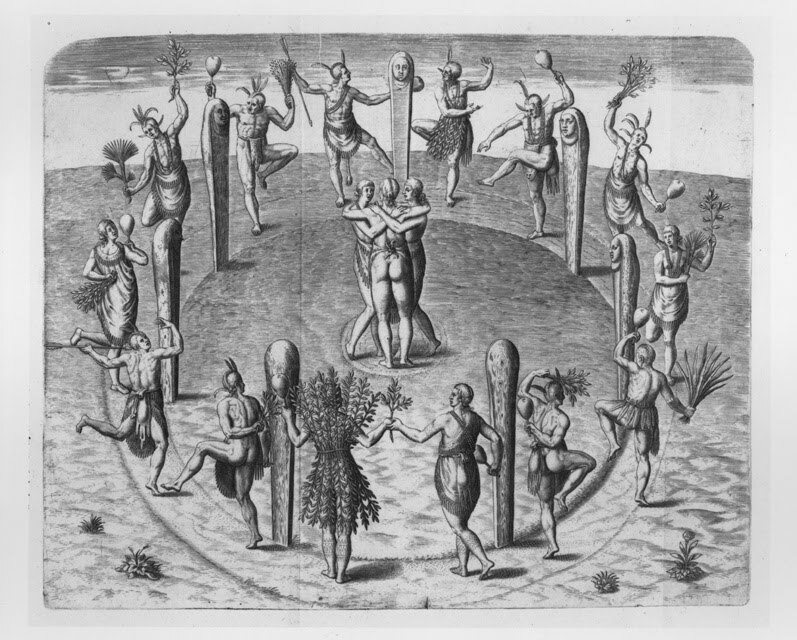 William Simmons’ Spirit of the New England Tribes: Indian History and Folklore 1620-1984 (1984). Neal Salisbury’s 1982 Manitou and Providence: Indians, Europeans, and the making of New England 1500-1643. See also Cautantowwit’s House: An Indian burial Ground on the Island of Conanicut in Narragansett Bay by William Scranton Simmons (Brown University Press, 1970). Neal Salisbury’s 2003 article in Ethnohistory 50 (2): “Embracing Ambiguity: Native Peoples and Christianity in Seventeenth-Century North America”. Frederick Johnson’s Notes on Micmac Shamanism, in Primitive Man Vol. 16 (1943). William S. Simmons: Southern New England Shamanism: An Ethnographic Reconstruction, in Papers of the Algonquian Conference 7 (1976). Penobscot Tales and Religious Beliefs, Journal of American Folklore 6 (1935). Michel-Gerald Boutet’s The Great Long Tailed Serpent: An Iconographical study of the serpent in Middle Woodland Algonquian culture (2011). 5. Authentic expressions of magic realism in Algonquian spiritualism appear in early native texts. See especially the stream-of-consciousness-like account of Joseph Nicolar (1893), published in 2007 as The Life and Traditions of the Red Man: A Rediscovered Treasure of Native American Literature, edited by Annette Kolodny and Charles Norman Shaw. See also Clara Sue Kidwell’s article, “Ethnoastronomy as the Key to Human Intellectual Development and Social Organization” in Native Voices: American Indian Identity and Resistance (2003). Another good Native source is Frank Waabu O’Brien and Julianne Jennings’ A Cultural History of the Native Peoples of Southern New England: Voices from Past and Present (Bauu Press, 2007). For an appreciation of the role of dreams and dreaming in Algonquian culture and the significantly contrasting world views of colonists and Indians, see Ann Marie Plane’s Dreams and the Invisible World in Colonial New England: Colonists, Indians, and the Seventeenth Century (2014). Among the many sources for particular Algonquian myths and legends are William Simmons’ papers, Return of the Timid Giant: Algonquian Legends of Southern New England, Algonquian Conference 13 (1982) and Genres in New England Indian Folklore, Algonquian Conference 15 (1984). 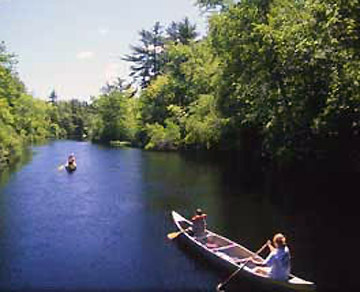 A classic source is Charles G. Leland’s Algonquin Legends of New England (1884). For insight into Algonquians’ practices of transferring the spirit world onto ceremonial landscapes, see James Mavor and Byron Dix, Manitou: The Sacred Landscape of New England’s Native Civilization (1989). Nicholas Campion’s Astrology and Cosmology in the World’s Religions (2012).